SAFED, Israel—Tucked into the side of a mountain with the resting place of Rabbi Simeon ben Yohai, the author of the Zohar, looming in the distance, Yeshivah Temimei Darech was founded nine years ago with a low budget and high hopes by two young English-speaking Chabad-Lubavitch rabbis. They, like their students, are ba’alei teshuvah, those who have returned to a life of full-fledged Jewish observance. This week, joined by a surging throng of celebrants, the two rabbis—Rabbi Shalom Pasternak, the yeshivah’s director, and Rabbi Ariel Gorenstein, its rosh yeshivah (educational director)—ushered in a new era for their school as they danced and sang their way with a newly completed Torah scroll through the narrow and winding streets of Safed under the traditional chupah (wedding canopy) used for such processions. 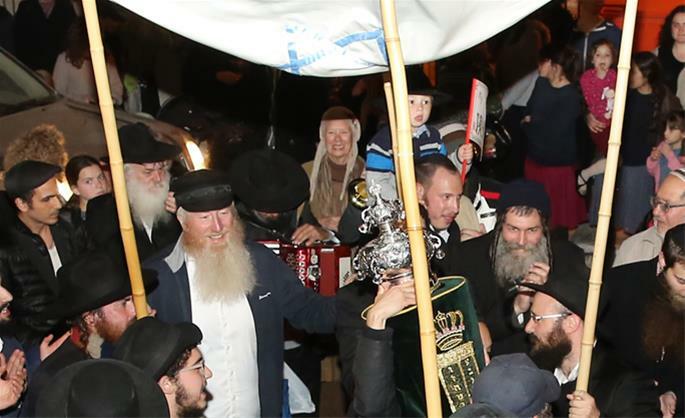 The route took the revelers from the Pasternak home, where the final letters of the Torah were inked in by a series of community leaders under the scribe’s watchful eye, to the yeshivah for hours of hakafot (circle dancing with the Torah) in further celebration and bliss. A gala dinner followed. The group proceeded mostly along Ari, a street named for Safed’s leading 16th-century Kabbalist, Rabbi Isaac Luria, known as the Arizal, and the address of the yeshivah. Among the beaming crowd were the rabbis’ wives, Roni Pasternak and Chana Gorenstein, both of whom were instrumental in the school’s founding and growth. Among the many participants was Rabbi Chaim Kaplan, director of Chabad of Safed and a strong supporter of the yeshivah since its inception. Gorenstein, the quieter of the two rabbis, looked up with quill in hand after writing the second to the last letter in the Torah, the alef in the word Yisrael, and appeared to breathe a deep sigh of satisfaction, pronouncing the letter to also be the first one of his name. From its establishment in 2009 on the 18th of the Hebrew month of Elul, the anniversary of the birthdays of Rabbi Israel Baal Shem Tov, founder of the Chassidic movement, and Rabbi Schneur Zalman of Liadi, the Alter Rebbe, the founder of the Chabad movement, the yeshivah has grown steadily in capacity and stature. More than 1,000 people bought letters and verses in the Torah in a custom preceding such inauguration ceremonies, based on the biblical commandment for every Jew to write his own Sefer Torah, which can also be fulfilled by buying a letter in a Torah. The Torah was donated by Yosef Asher Chaim Farzan and family of Great Neck, N.Y., in the merit of their father, Shmuel ben Avraham Farzan, whose yahrzeit (anniversary of passing) is the 24th of the Hebrew month of Adar, corresponding to Sunday, the day chosen for the event. The young Farzan befriended Pasternak and became a supporter after sending a business associate to Israel around the time of the yeshivah’s founding to specifically identify a yeshivah to support. “It was quite a miracle how it all happened—how he found us,” added Pasternak. 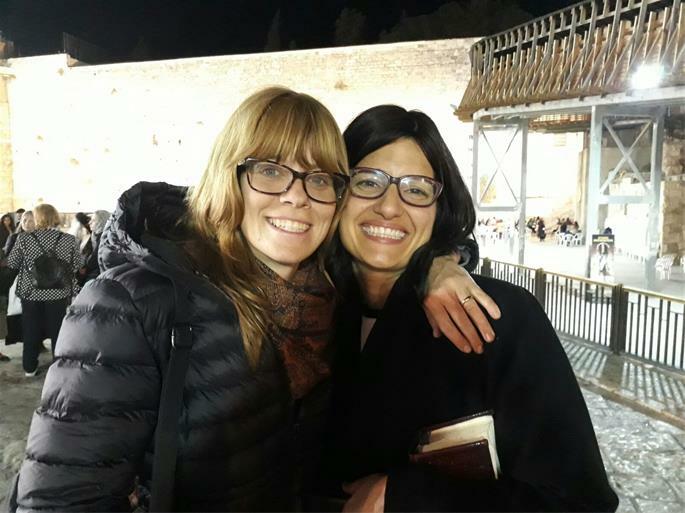 The initial impetus for the founding of the yeshivah began in 2001 when the women who would become the rabbis’ wives met at another yeshivah in New York. Things clicked so well between the women—themselves serious young students—that they kept in touch, married within the following few years, and with their husbands, made their way to two historically significant cities in Israel. Once there, the women remained in touch while their husbands pursued semichah (rabbinic ordination) in their respective cities—Safed and Rehovot. The couples got together periodically to co-produce outreach events in Safed, with the Gorenstein family making the long trek up north. Within a short time, a dream began to unfold. Pasternak, 32 at the time and a fiery teacher of Chabad chassidus, opened the yeshivah with his good friend, Gorenstein, also 32. Seasoned in halachah (Jewish law) having studied at Israel’s acclaimed Heichal Shlomo program at Kollel Ohr Yakov in Rehovot, Gorenstein was well-suited for his role. From the modest beginnings of one student, enrollment has now grown to 30, with a staff of teachers, a manager, a cook and Chabad rabbinical-student mentors from abroad. The yeshivah has become a preferred destination for students seeking a rich, spiritual environment in an intentionally intimate setting. In recent years, an ordination program was added, which has begun to produce its first cohort of rabbis, while others have graduated to married life and leading Chassidic lives of their own. 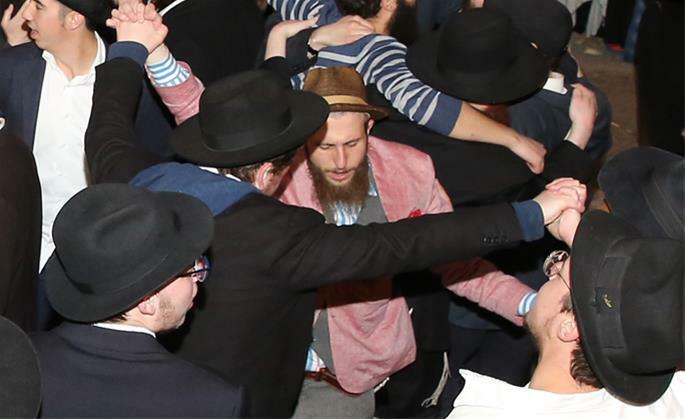 Most notably, what seems evident about the yeshivah is that the students appear to be very pleased with their experiences, growing in the ways Chabad educators hope for, and they are particularly joyful about the yeshivah owning its own Torah.